You might have hated them in high school because they wrecked the grading curve. Or maybe you were that overachiever that set the bar so hopelessly high that everyone else despised you. No matter…thankfully, high school only happens once in a person’s life. When it comes to plants, overachievers are usually welcome. They are the selections that are strong, fast growing, or early blooming. There is no grading curve to ruin and gardeners love them. At Poison Ivy acres the Dahlias I ordered from Corralitos Dahlias in Colorado are once again the garden’s go-getters. They are in bloom in June…June! While the Dahlia tubers that we planted at the end of May are growing well, the plants that came as cuttings from Corralitos are flowering. These cuttings arrived in mid-May. They are always about three inches tall…tiny. I potted them in 6” pots with some time-release fertilizer and kept them in my growing shed until the first week in June. At that point the cuttings had grown to 8” tall and into the garden they went. Now, four weeks later, they are flowering. I’d be interested in speaking with a Dahlia expert about why a shrimpy cutting produces flowers more quickly than the fat, healthy tubers that were planted much earlier. But in the meantime, I’m loving these highflyers. Bloom early and bloom often. 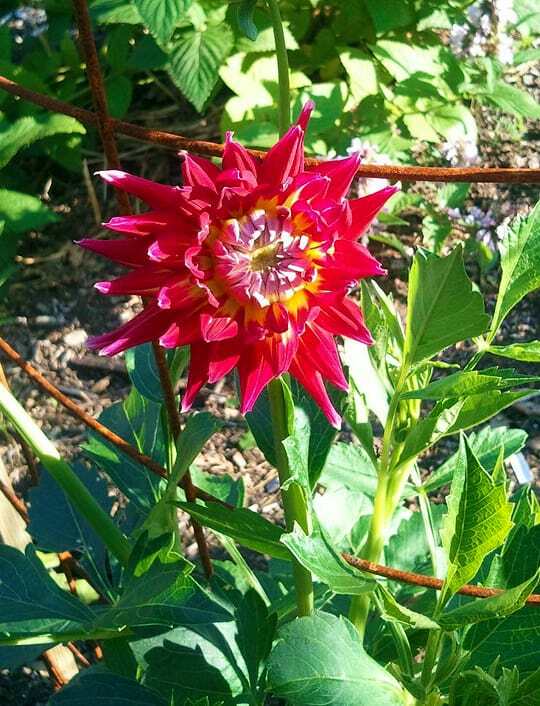 This Dahlia, named Crazy For Jessie, started opening two days ago. It is one of three plants that are already in flower in the cutting garden.